In order to better reflect the expanded water supply available to Coastal Bend customers rules for triggering water use restrictions during drought conditions have been revised by the City of Corpus Christi, the manager of the regional supply system. 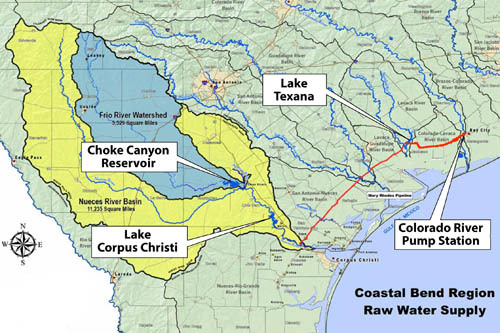 The easing of restrictions reflects the fact that water sources for the regional water system are now more diversified with surface water coming from the Colorado River and Lake Texana (on the Navidad River) in addition to Lake Corpus Christi and Choke Canyon Reservoir on the Nueces River. The rules eliminate the previous first stage which included voluntary water conservation measures. Rules prohibiting lawn sprinkler use between 10 a.m. and 6 p.m. are always in effect regardless of any drought conditions.